There was more to the evening than Ranger's Colton Orr checking Matt Cullen across the face and the return of Sean Avery's antics (major and minor punishments galore) in this special, magical time of year. Knowing young Tom Renney wanted nothing more than to beat a Red and White Rider Pump carbine action, five-hundred range model hockey team, he was told pre-game there was one more present behind the wish tree. Suspiciously, he didn't change anything in his lineup and still got want he wanted. A win. Spoiled kid. Jagr broke out with two tallies (you heard that right!) and Brendan Shanahan set up a pair of third-period power-play goals to help the New York Rangers beat the Carolina Hurricanes 4-2 on Wednesday night. Chris Drury and Dan Girardi also scored for the Rangers, who snapped a three-game losing streak, winning for only the third time in the last 11 games. Official recap here. The Rangers were at it again, a defense-first minded team and stuck with their guns. Although there were sloppy turnovers in the first period, the team was generally solid - crashing the net and outshooting Carolina 2 to 1 throughout the game. In fact, 'one-game rejuvenated' Captain Jaromir Jagr scored his first goal of the evening by planting himself on the far-end of Hurricane Cam Ward's net - a Euro-Dirty-Goal. Congrats to our Jagr for playing hockey on the boards, as opposed to playing European style. Whether it was Tom Renney, Brendan Shanahan, Chris Drury or Dancing Grandma, Jagr took his lead from someone and we are all grateful. Forgive my repetitiveness, but a "don't get my fingernails dirty" A-level player like Jaromir Jagr does not crash the net, so it was refreshing to see. Marek Malik started the game and did a decent job. Marc Staal and Dan Girardi continue to amaze Blueshirt fans -- this youthful depth will only benefit the NYR franchise this year and seasons to come, or until Slats trades them this February for an aging potential Columbus Blue Jacket veteran? Joking aside, rumor has it that the Blueshirts are trying to pry either veteran Adam Foote or top-four defenseman Rostislav Klesla from the Columbus Blue Jackets in exchange for Petr Prucha. Some of our young'ens may be thrown into the deal -- none of us like the sound of this. Just for fun, throw in Malik & Hossa for 'shits & giggles'....we triple dare you Slats. According to Larry Brooks of the NY Post, "...The 36-year-old Foote, a physical presence the Rangers so obviously lack on the blue line, is on the final year of a three-year contract at $4.6M per that contains a no-trade clause he would have to waive in order to come to New York. If willing, the two-time Cup-winner with Colorado will become one of the prime rentals on the market as the Feb. 26 deadline approaches. Hence, the Rangers' attempt for a pre-emptive strike. Klesla, the multi-dimensional fourth-overall selection in the 2000 Entry Draft who will turn 26 in March, is under contract through the 2009-10 season at $1.6M per. " The next five games are all against Canadian franchises and we begin the trek with the Toronto Maple Leafs this Saturday night at the legendary A.C.C. in Toronto where tickets are not accessible and 'standing-room only in the rafter passes' goes for $125 a pop. Prepare for a revival of the most-famous Sean Avery/Darcy Tucker meeting -- tickets for that alone are sold-out and the potential pre-warmup alley fight will be available on pay-per-view, so watch for the agitation, check in with The Dark Ranger - more entertaining on a Saturday night than Die Hard 4! Killer game Dark. We need that 'D' man and we've needed him all along and Renney and Sathers know this and they will make the right changes. Have faith he who lives in the Dark (kidding)..2008 will bring the team our rivals have been dreading. It would be nice to have a little more confidence in our team. I don't trust this 'defense' style of play and the third period last night proved that when you take it to the net, you get the ugly, dirty and winning goals. This is today's hockey. 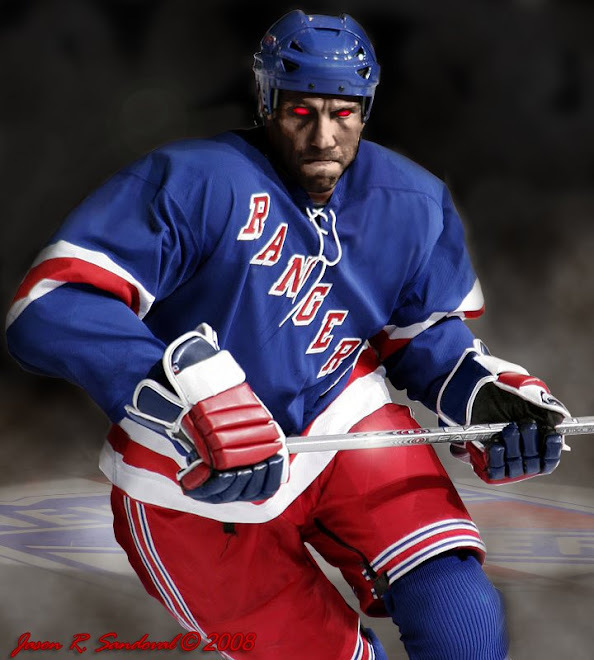 We can only hope other teams will dread the Rangers. Would be nice. Just a note on the trading TDR, with the cap situation, deals like the Rangers Caps with Jagr can't exist - the Caps still pay half his salary. I recall reading that a team can't eat part of a guy's salary if he is on another team anymore. So that will limit the big trades after the break, and will mean that once Malik is gone, so is his $3 mill-plus cap hit. Can't a guy dream anymore, Scotty? Yes, I am aware of the new rules, but...there are teams out there that might feel Malek would be worth 3 mill. right? Anyway, too bad that things are so tight, as we would be trading 1/2 the team to make improvements. Great game last night. It will be interesting to see what Sather does. Howson said tonight that no deals were getting done tonight. 1) Whats with all the Colton Orr/Cullen hit issues? On replay it was NOT interfiefence. His hands came up a bit but mainly to help absorb the blow. It was a clean hit from what we saw. A classic Scott Stevens type open ice check. Period. 2) Perhaps if it was done by someone other than Orr and Cullen wasn't injured no one would have noticed as much? We don't want to see a suspension given out here as it would tend to reduce the hitting that we all love in the game! 3) Keep the fighting/hitting in the game. Get the stick work, skate stomping out! Hey Dark Ranger. Bet you can't wait for Avery-Tucker III to end the year. faux...The Rangers have officially requested the NHL to rescind the interference call on Colton Orr - because you are correct...it wasn't dirty. 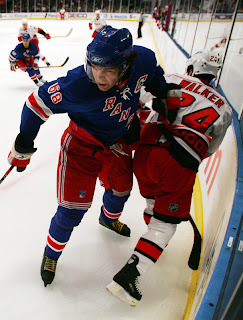 For some reason and probably due to the profile of NYR, one of the least physical teams in the league (REALLY!) gets unfairly penalized for physical things. Take for example the Hollweg/Simon incident, and Hollweg is one of three to be warned by the league. Pundit...it's going to be a good one, I hope. I can only wish to see Tucker's head on the ice and no one applauding. Avery is razzing up the press as well...I'll post one from the National Post.